Hi, I’m Kellie Baxter with the Utah Asthma Program. I coordinate the Utah Asthma Home Visiting Program, an in-home asthma education program. Six months after the launch of this program, our Evaluator Holly Uphold completed a process evaluation to help improve implementation of the program. The evaluation produced many recommendations. Implementing all of these recommendations felt daunting for a program in its infancy with newly trained staff still getting their bearings! Our solution? A post-evaluation action plan. We started by dedicating a portion of our monthly partner meetings to evaluation. We reviewed the recommendations with stakeholders and reached a consensus about which recommendations should be implemented. From there, we created an action plan that could address all the recommendations without overwhelming staff implementing the program. As coordinator for the program responsible for implementing these changes, I started by separating out the recommendations that I could easily do myself (e.g. minor changes to data collection forms), and which recommendations required stakeholder input (e.g. changes to program curriculum, format, or referral processes). This decreased the number of recommendations that needed to be prioritized. 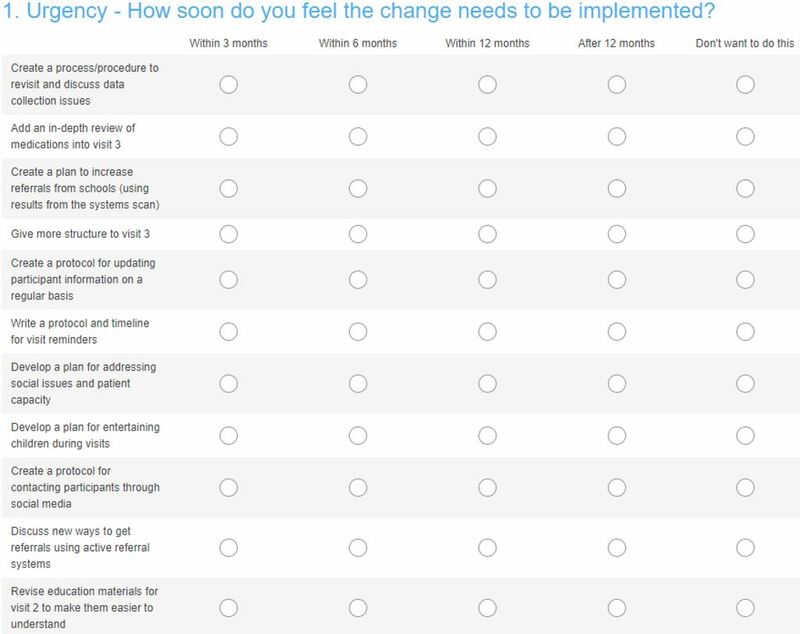 Cool Trick: Use an online survey to streamline the prioritization process. Stakeholders were given an online survey and asked to complete it before the next monthly meeting. This survey listed the recommendations to be implemented and required that stakeholders rank them by the evaluation criteria. This helped identify areas of consensus among stakeholders and further narrowed the list of recommendations that had to be discussed and prioritized in person. Results from the survey were presented at the monthly partner meeting. Recommendations that didn’t have clear consensus from the survey were discussed in-person during a group prioritization activity. 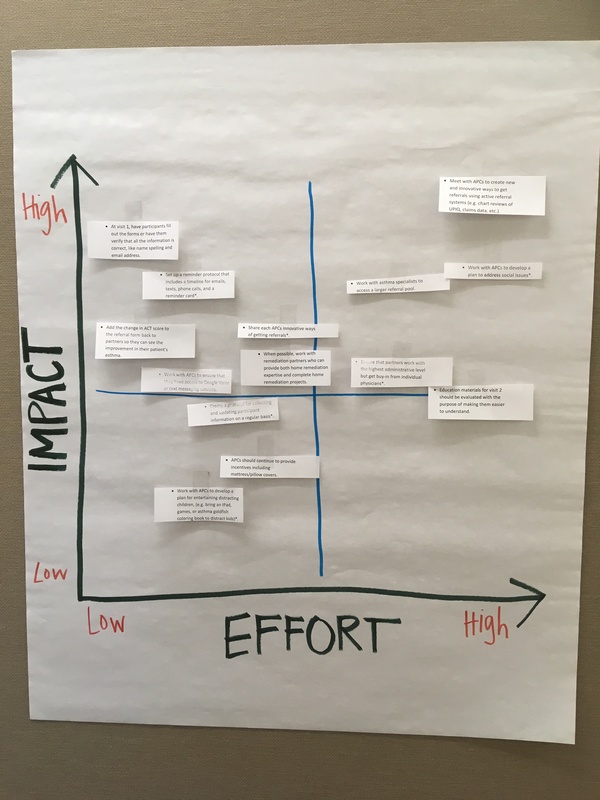 Rad Resource: Techniques like an Impact Effort Matrix or the NACCHO Guide to Prioritization Techniques can help guide your group prioritization discussion. Using the results from these prioritization activities, an action plan was created and each recommendation was assigned a timeline and lead person. Progress on the action plan was reviewed at monthly meetings. Hot Tip: Creating the action plan as an online shared document will help stakeholders keep track of the recommendations, who is responsible, and the deadlines. That recommendation brought tears to my eyes. We hardly ever ask stakeholders what they think. We fall in love with our pet recommendations and priorities and then wonder why implementation is so rocky. We need more cool tools like this. Thanks for sharing your evaluation process as it pertains to the Utah Asthma program. In my experience any time a project on this scale is rolled out – evaluating it can be challenging. I really liked the idea of engaging stake holders prior to meetings, specifically online. I think that this allows for stakeholders to complete the surveys on their own time (which may increase response rates) and allows you a way to collect data easily. I am definitely going to utilize this in my next evaluation process. Have you thought about engaging participants of the study in the same manner to see if the program has been helpful (if you haven’t already)?